What does a private lesson in the First Step method consist of? The lesson must be an enjoyable process, in which most of the learning takes place through play, in optimal conditions for learning. Private lessons are individual meetings – where the participants are the parents, the baby, and the instructor. It’s a learning experience, and that’s why we call it a lesson. Private lessons are individual meetings – where the participants are the parents, the baby, and the instructor. It’s a learning experience, and that’s why we call it a lesson. We believe there’s no such thing as “a baby with a problem” – only a baby who “hasn’t learnt “ what he “has to learn” at a specific developmental stage. Parents often ask us “to treat the baby’s problem”. In our perception, treatment is an attempt to “perform a repair” rather than a lesson where the starting-point is the assumption that the baby doesn’t know – so we offer the baby an environment and stimuli that will help him learn, or to reconstruct a previous stage in developmental learning. A First Step lesson is set in surroundings that are warm, comfy, and relaxing – for the parents and particularly for the baby. 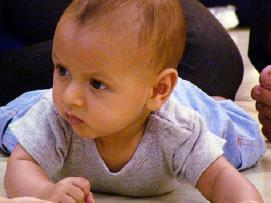 We know that when a baby isn’t relaxed, he won’t be able to learn. So the lesson must be an enjoyable process, in which most of the learning takes place through play, in optimal conditions for learning. Important! If a baby cries and fusses during the lesson, s/he won’t be able to learn.